YEREVAN (ARMENPRESS)—A two-day linguistics conference entitled “Issues of Convergence of Western Armenian and Eastern Armenian” is currently underway in Yerevan, with linguists, literary scholars, and other specialists from various fields in Armenia and the Diaspora in attendance. Minster of Diaspora Hranush Hakobyan opened the conference on Wednesday by stating that the Armenian Genocide was a major blow to the Armenian language, causing it to dissociate from the Armenian homeland, spread around the world, and became eradicated, resulting in the loss of many dialects. “Among the irrevocable losses we suffered because of the Armenian Genocide are our language losses, we have a lot to do to overcome these losses. Dozens of Western dialects were lost, standard Western Armenian became deprived of its historical homeland and opportunity for development. Western Armenian needs great support because it carries out the important function of Armenian identity preservation in the Diaspora,” Hakobyan said. “Today the convergence of Western Armenian and Eastern Armenian is very relevant as there are certain regulation issues to the enrichment of the language and word groups. The relevance of these issues becomes more exacerbated as the geography of language use and the language users themselves gradually reduce,” said Yuri Suvaryan, member of the National Academy of Sciences. 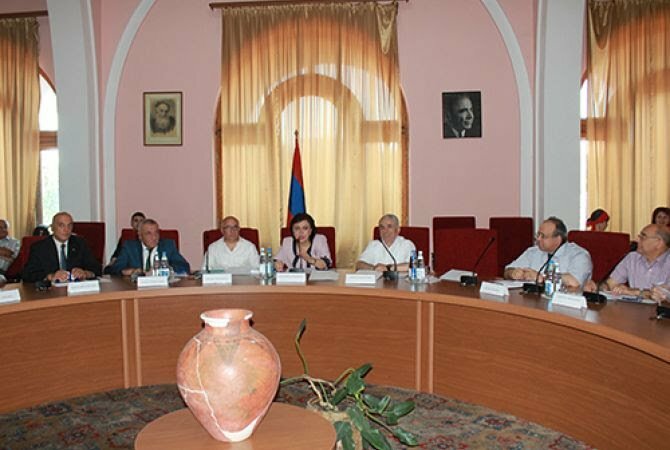 According to Hakobyan, a package of proposals is expected to be formed by the end of the conference. The proposals will be voted on and the most optimal variant will be chosen. Will Asbarez please continue to give us updates on this extremely important conference? The publication of some of the proposals and the outcome of the voting would be very appreciated. This is an important conference that affects all of us in the Diaspora. Minister Hakobyan is absolutely correct in stating that the Genocide caused irrevocable losses to language. But then, that’s what Turkey intended isn’t it? The erasure of a people includes the erasure of their language. Very important indeed, but unfortunately nothing will come out of this as usual. Eradicating non Armenian words like Globizatsia, Speculatsia, Informatsia etc., words like these that I can guarantee were even spoken even at the meeting mentioned above are a bigger problem and unfortunately used by Government and news media officials equally more frequently than the problem that is being discussed at these meetings. Please do not label every shortcoming in Armenian life on the Genocide!!! Like Perouz, I would love to learn the outcome of this important conference. Please keep us posted, Asbarez, with as much detail as possible. Shnorhagaloutiun. Not to sound skeptical but considering the fact that almost no one in the ROA bothers to even learn Western Armenian,, “Convergence” sounds like a hegemonic attempt to eradicate Western Armenian in favor of its Eastern variant. Why would the languages “converge.” Why would they not diverge or continue to exist side-by-side. I am always amazed at some of our compatriots’ naivete. as much a s I support and hope for the ROA’s success, let us not forget that it is in direct cultural competition with the Diaspora. What Hakobyan knows or does not know about Western Armenian would be interesting to see….It would be nice if the oligarchs who run ROA today disappeared and the country prospered and started supporting Western Armenian and its instruction in the diaspora in the form of more and better Armenian schools and cultural centers and university chairs. Then I wold believe this initiative. But maybe I am being too suspicious–I don’t think so. Never mind convergence – the least the Republic of Armenia government can do is to return to classical (Mesrobian) spelling. As for language convergence – my feeling is that the Republic of Armenia quietly considers that, with the numbers of its citizens emigrating, western Armenian speakers should adopt the emigrants/immigrants language and forget western Armenian altogether. This conference, to me, is nothing more than a propaganda exercise. This seems to me to be a regular exercise by the Ministry to justify its existence. Not to be taken seriously, as is this idea of convergence. Eastern and western Armenian should be left alone, not converged, whatever that means. And to say the RofA has the purpose of western Armenian being forgotten altogether…let’s be careful and make sure we separate the country’s true intellectuals and what they might think from the current government and Ministry lackeys and what purposes they may or not have.